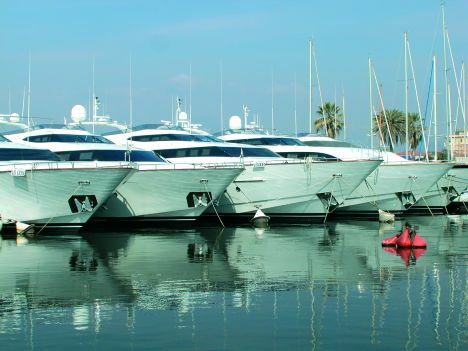 The luxury yacht market, due to the features of the target and to market trends, is the most appetising and interesting business area for pleasure craft. This attractiveness is confirmed by the recent entry of new international players some of whom already operate in the luxury goods segment: names such as Bulgari, Ferragamo, Dredner Kleinwort Capital, etc. The Italian boat-building industries have taken on a role of prime importance within the global luxury yacht market, with competitive abilities at international level. The other element is the evolution of the concept of luxury which today sees a new paradigm emerging, advanced luxury, within which there is considerable competitive positioning. In comparison with "traditional luxury", "advanced luxury" is fundamentally characterised by greater "intimacy and familiarity" with the "top of the range" rather than the mere exterior trimmings of luxury. 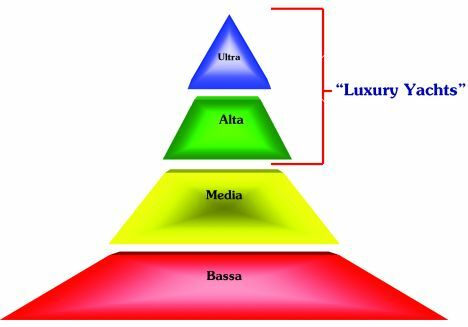 Figure 1 shows the pyramid of luxury; as may easily be seen, luxury yachts stand precisely at the peak, representing par excellence the high level of luxury (yachts and "large yachts") and of super-luxury(maxi yachts). How much is this market worth? The global pleasure boat market amounts to an overall 15.000 million euros (figures for 2002), showing a growth of 4% since the year 2000. Italian boat-building industries, second only to the Americans, have a market share of 11% and at the same time have experienced an increase in turnover of 44% as against the values of 2000. 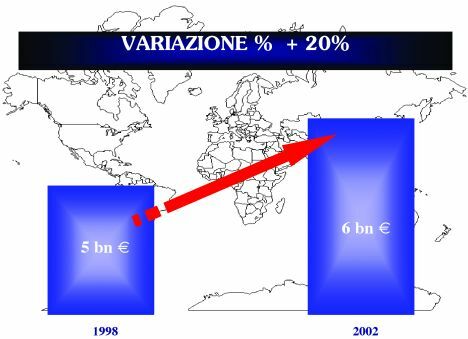 In other words, the Italian boat- building industry, in only 2 years and within a context of recession and uncertainty regarding global economy, has grown by almost 50%. Luxury yachts have played an important part in achieving this record. Given the foregoing it is natural to wonder about the value of the luxury yacht market: about 6 billion euros (estimate resulting from data processing supplied by internationally accredited sources). This means that 40% of the world yacht market comes from vessels that can be classified within the range of "luxury yachts" (see figure 2). If these are the data, it's important at this point to understand the world trend in the luxury yacht market. Here too the results are astounding: statistical estimates state that in only 4 years the luxury yacht market grew by 20% from 5.000 million euros to the 6.000 million of 2002. An important development that demonstrates the considerable and growing attractiveness of the international luxury yacht business. The top range of the luxury yacht market is represented by superyachts (pleasure craft longer than 24 metres) and in recent years there has been considerable dimensional growth, going against the trend of many other segments of the luxury market. Events such as the 11th September attack on the World Trade Center, the war in Iraq, the loss of wealth due to stock market crashes, fears about SARS, devaluation of the dollar and the yen, had absolutely no effect on this market segment, showing an outstanding anti-cyclic factor. This last is due to the fact that in spite of the adverse conditions of world economy the number of millionaires continues to grow and the new scenario of uncertainty has increased the desire to buy and live ultra-luxury experiences. Figure 3 compares the growth of superyacht orders from 1999 to 2004. 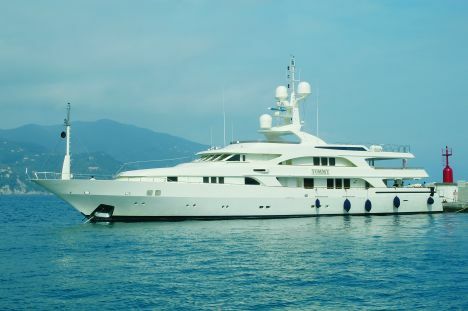 More specifically, in only 6 years the demand for superyachts has increased by 80%, largely in terms of motor vessels. Figure 4 shows the composition of the superyacht market both in relation to the main source of propulsion and with reference to the boat shape. 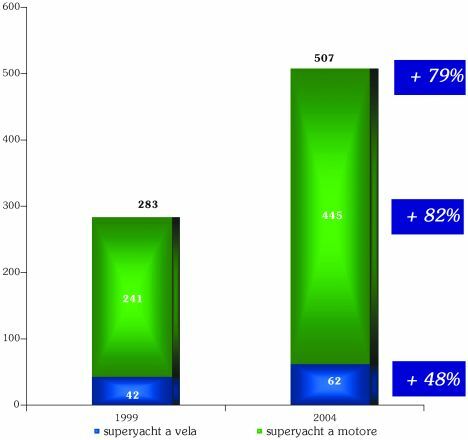 From the quantitative analysis it emerges that motor superyachts represent 88% of the world market as against 12% sailing superyachts. 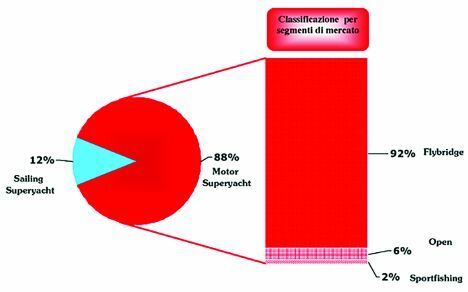 Within the macro segment of motor superyachts, the main micro segment is represented by flying bridge vessels (92%). In analysing the dynamics of the luxury yacht market one cannot avoid mention of a spreading phenomenon: open luxury mania. This is the result of the growing number of orders for open or hard top high performance vessels with modern, sporty lines. It is not by chance therefore that many boat-building industries have decided to horizontally differentiate their business model, entering into the open vessel segment. Research has demonstrated that the luxury open market has grown by more than 50% over the last 2 years. Open luxury mania finds expression in a new customer-profile that is coming to the fore: members of the new ruling class, a reflection of the latest paradigm of "modern advanced luxury". But the questions we naturally ask ourselves do not end here. What is the position of Italian boat-building industries in the super-luxury yacht market? Luxury yachts made in Italy are, for their prestige and intrinsic product features, appreciated and sought after in all the world's marinas. 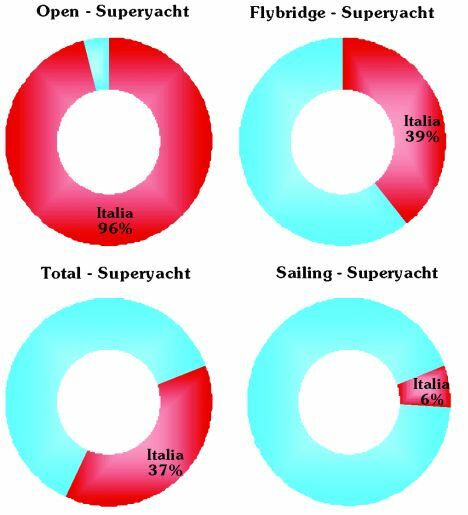 Figure 5 shows and compares the market slice of the Italian boat-building industry within the superyacht market and the main segments thereof. More specifically, Italy can boast a very high share of the market within the super-luxury open segment (96% of luxury opens sold in 2004 were designed, produced and marketed by Italian shipyards). Italy can also boast a high market share in the segment of flying bridge vessels, the predominant pleasure craft. Italian boat-builders have an overall 37% share of the world superyacht market. What emerges clearly from these data is the competitive advantage of the Italian boat-building system in the luxury yacht segment. What are the luxury yacht market forecasts? My own estimated forecasts are favourable, given that the unexpressed market (the market yet to be won) is equal to 50% of the whole potential market. It therefore goes without saying that Italian luxury yachts, on a par with other economic sectors, fully represent the Made in Italy concept worldwide.